"In a brilliant portrayal of women and their challenges, director Ben Ratner manages to keep his finger on the pulse of realism." 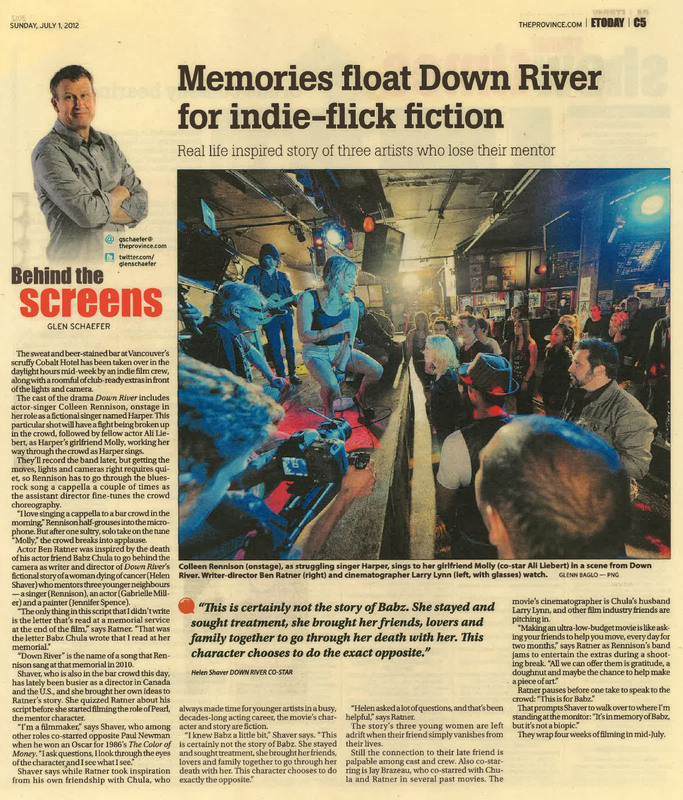 "Along with an inspired script from Ratner, “Down River” boasts an amazing cast..."
"Finally, a Canadian script worthy of its excellent cast." "Down River is an intelligent work with moments of poignancy and emotional resonance by a talented filmmaker." Very moving and delivers a highly affecting ending. You don’t need to know the back story to enjoy Down River, a multilayered character study with a strong B.C. accent. As of this moment, DOWN RIVER is my favorite film of Cinequest 2014, and I plan on getting the DVD just as soon as one is available. Times Colonist review of "Down River"
"Down River added Best Motion Picture and Best Supporting Actress to the Best Screenwriting award it took on Friday"
"Motion Picture Leo Winners & Nominees Led by Ben Ratner.s Down River"
"Down River was named this year's Best Motion Picture at the Leo Awards"
"Down River leads the list of film nominees with 13 nominations"
Writer/director Ben Ratner and actor Jennifer Spence chat with Fiona Forbes about why audiences should see Down River. Actor Helen Shaver on life, death and art. Colleen Rennison nominated for "Molly" in the category "Achievement in Music - Original Song"
At the Vancouver Film Critics Circle event, "Ben Ratner's Down River won best British Columbia film." 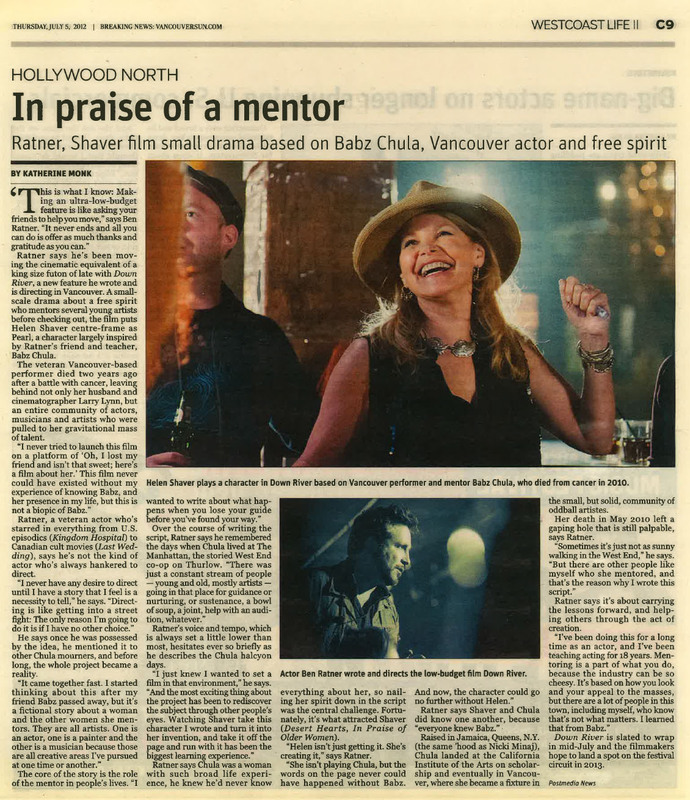 "Best British Columbia film went to Ben Ratner's "Down River", a drama inspired by late Vancouver actress Babz Chula. Best British Columbia Film went to Ben Ratner's Down River, a heartfelt drama inspired by the beloved late Vancouver actress Babz Chula. "She names Vancouver-based thesp-writer-director Benjamin Ratner (“he’s an actor who gets beautiful performances in his film ‘Down River’")"